The value of Bitcoin has passed the symbolic $500 mark for the first time in a month, suggesting that the cryptocurrency is stabilizing after a rollercoaster six months. Bitcoin hit an all-time high of $1,000 back in November of last year, but a lot has happened since then to change things. Mt. Gox, once the world’s top Bitcoin exchange, went bust and out of business, while China has carried out a series of crackdowns that have impacted exchanges in the country. With the first generation of Bitcoin businesses like Mt. Gox less influential today, the hopes of ‘mass-marketizing’ virtual currencies are held by venture capital-backed companies like BitPay, which recently raised $30 million, Coinbase, which raised a $25 million Series B round last year, and Circle, which launched its next-generation banking product to all last week. 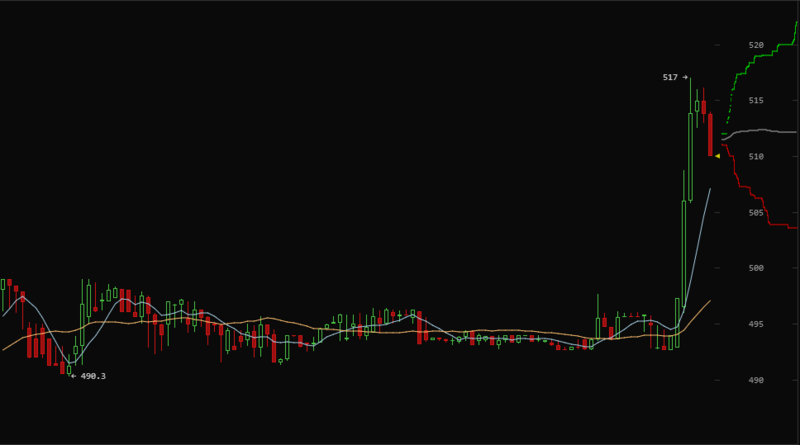 Interestingly, it looks like a significant transaction took the cyber currency over today’s landmark. That’s a reminder that though many people see the future of Bitcoin as leveling the playing field for all, there are still individuals with vast amounts of wealth tied to the ecosystem. This chart from Bitcoinwisedom.com shows today’s pricing.